The fears that the Rio 2016 Paralympic Games would be an unsuccessful event – marred by cutbacks to events, teams unable to afford to participate, incomplete work, and the lingering Zika outbreak – didn’t eventuate. Instead there was a feeling that this event had pushed the Paralympic movement forward. New Zealander, Liam Malone, was perhaps one of the surprise characters to emerge from Rio. His confident interview after winning his 100m T44 heat got him much attention for both his confident and humble personality. His backstory was just as telling. The 22 year old, whose mother died to cancer four years ago, needed money to purchase a set of carbon fibre prosthetic blades to avoid what he describes as going down the wrong path. So while at University, Malone, who was born without fibulas raised NZ$20,000 through crowdfunding and then went on to qualify for the Paralympics. Not bad for someone who has only been sprinting for three years. At Rio, he came second to Great Britain’s defending gold medallist, Jonnie Peacock in the 100m T43/44 class, which the Kiwi admitted was not his best event and then went on to win the 200m and 400m beating Paralympic record times previously set by Oscar Pistorius. I’m generally not a fan of Opening and Closing ceremonies as much of them are for the athletes, and this one in particular ran way over time. However in the space of about 10 minutes, there were two instances that will be remembered as iconic moments of the Paralympic movement. Márcia Malsar, a former sprinter and first Brazilian to win a gold medal at the Paralympics carried the torch in the Maracana stadium. In the pouring rain, and on unstable footing, the four-time medallist drops the torch and takes a tumble. To the shock and concern of tens of thousands of spectators in the stadium, she picks herself up with the aid of only two support crew members. They simply hand back the torch and Malsar is left to complete the entire leg of the relay. What needs to be stressed is that there wasn’t any overreaction, Malsar was not picked up or hurried along, and more importantly, her path was not shortened. It made a powerful statement about disability and a powerful representation about the Paralympics – the fragility of disability was on display but the determination to go on unaided triumphed here. The second was just as powerful. Clodoaldo Silva, carrying the final leg of the torch relay pushed his way to the top of the stage only to be greeted by a set of stairs. Significantly it was an awkward few moments, one that resembles the feeling wheelchair users have faced before. But in a powerful statement, a ramp opens up for the torch bearer and a path is revealed – to me it was a poignant representation of that challenge to be more inclusive of people with disabilities. One of the most pleasing things about being in Rio was to see how the Brazilian locals supported the Paralympic Games. The threats that small crowds would be in attendance and there would not be the same hype as London did not eventuate. Instead, the crowds were vocal, supportive, and had been captivated by the spirit of the Paralympics. The middle Saturday of the Paralympics had more people than the busiest day of the Olympics. Stat. 167,675 people on the third day surpassed the 157,000 some three weeks earlier. And just as telling is this observation by Jacob Steinberg from The Guardian, writing in Rio. 28 year old Brazilian, Daniel Dias was marked as one to look out for at the Rio games and he did not disappoint in front of his home crowd. Riding the support of a whole nation he finished with nine medals, four gold, three silvers and two bronze to take his career tally to 24 Paralympic medals (14 gold), surpassing Australia’s Matthew Cowdrey as the most successful male swimmer. Brazilians were in love with their hero, who was such a visible face everywhere around the host city. 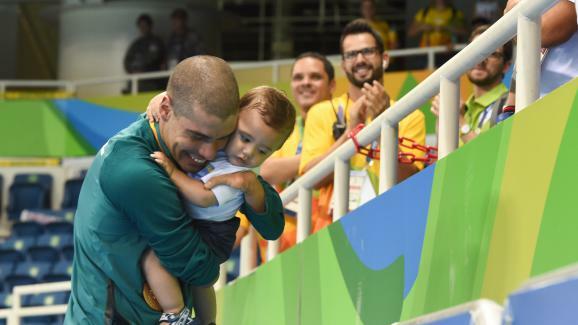 And to add another reason to love this remarkable athlete was when he was captured holding his son in a touching moment after winning the 50 metre freestyle S5. Another athlete that had been earmarked to finish on the podium was Australia’s Curtis McGrath in the KL2 Paracanoe. The 28 year old, who lost both legs while serving in the defence forces in Afghanistan was the reigning world champion going into this meet – the first time it was included in the Paralympics. What is remarkable about McGrath was that he had to change kayak disciplines and basically learn a new sport in under two years, because the V1 was not included in the 2016 program. McGrath won gold in a personal best time of 42.190s and was then selected to carry the Australian flag in the closing ceremony. In the race prior, Susan Seipel won bronze for Australia and to cap off a successful morning on the water, Amanda Reynolds finished with silver crossing 0.03 seconds behind Great Britain’s Anne Dickens. 6. Australia’s Maddison Elliott wins gold by breaking World Record, and becoming first S8 swimmer to go under 30 seconds in 50m freestyle. In London 2012, at 13 years old Maddison Elliott became the youngest Australian to medal at the Paralympics when she won bronze in the women’s 400m and 100m freestyle S8 events, silver in the 50m freestyle, and then became the youngest gold medallist in Australian history when the 34 point relay team won the 4×100 metre freestyle. She also attracted the attention of the media out of the pool when she gifted Prince Harry a stuffed Australian Paralympic mascot. But in Rio, her performances again spoke the loudest. On the penultimate day of the swimming schedule Elliott qualified second behind Great Britain’s Stephanie Millward in a new Paralympic record in the 50m event. That night in the final, the Australian blitzed the field. Elliott became the first S8 swimmer to go sub-30seconds in the 50m freestyle, picking up gold and a world record 29.73 seconds. Australia also finished 1-2 with teammate Lakeisha Patterson 0.40 seconds behind, in a time that equalled the previous world record. A disappointed Millward finished in fifth, behind China’s Jiang Shengnan and compatriot Steph Slater.